Once the city’s Meatpacking District, this near-western part of Chicago is brimming with culture and culinary hot-spots. 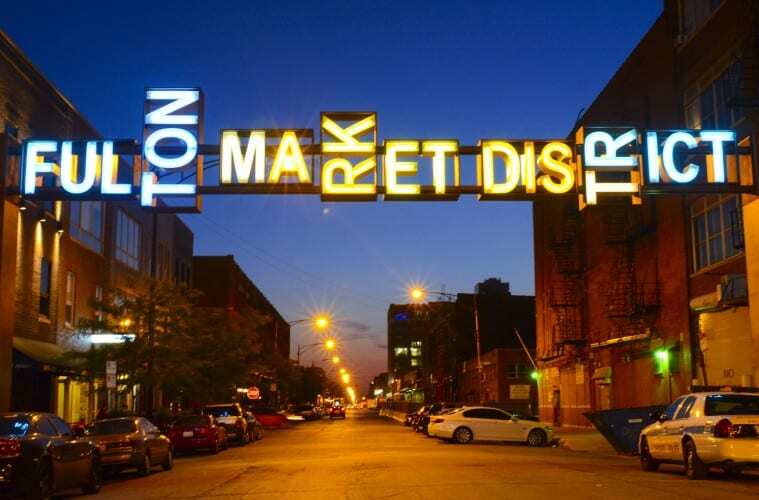 Much like Milwaukee’s Third Ward, the historic warehouses in Chicago’s Fulton Market District are celebrating a second chapter with the opening of new art galleries, hotels, bars and restaurants, inhabited by folks like Top Chef winner Stephanie Izard and, of course, Google. There’s even a bar where the interior design is inspired by Wisconsin’s most famous architect: Frank Lloyd Wright. For lovers of design, history and art, this is the best neighborhood to visit right now in the Windy City. Arrive in town via Amtrak (it’s a 90-minute trip to the Loop) and take a brisk 15-minute walk (or a five-minute Uber ride) to the Soho House, your base camp for the weekend. This haute, members-only club in the West Loop, which opened in 2014, flaunts overnight accommodations that allow access to its on-site restaurants, bars, spa and rooftop pool. Tucked into a building that dates back to 1907 and once housed the Chicago Belting Company, the vibe includes exposed-brick walls, floor-to-ceiling windows and eateries serving everything from fried chicken to afternoon tea. Rooms are spacious, given that this hotel is outside of the Loop where real estate is at a premium. Celebrate a night in by grabbing drinks at Fox Bar. Chicago’s craft-beer scene is experiencing a renaissance, just like Milwaukee. Taste for yourself — or choose a farm-to-glass cocktail — as you listen to vinyl records (stored in a wood crate) in this tiny bar that, in many ways, emulates a turn-of-the-century saloon. Hungry? Pick up the retro payphone and order a pizza from Pizza East (the phone’s sole purpose). Now it’s time to leave the hotel. Start with breakfast at La Colombe, the coffee roaster everybody’s talking about. Open in the West Loop since 2011, this is the closest of its Chicago cafes to where you are, and the first of that bunch to open. Pastries hail from locally acclaimed Alliance Bakery while the vibe is industrial-chic with exposed-beams and subway tile. Looking for something different to drink? Try its cold-pressed draft latte, served from a tap, just like beer. Gallery-hopping in this part of Chicago is strong, even on a Saturday afternoon. Check out Mars Gallery, a 30-year-old gallery with exposed-brick walls that’s largely responsible for the neighborhood’s shift towards art and design. Although it’s not in the West Loop or Fulton Market neighborhood, the 606 is a must for any fan of urban evolution. Much like New York City’s High Line (elevated rail tracks-turned-park), the graffiti and art game is strong along this 2.7-mile stroll running through Humboldt Park, Bucktown, Wicker Park and Logan Square. A great little boutique along West Fulton Market Street is Billy Reid. The Louisiana-based men’s and women’s clothing retails a preppy, classic look with custom-leather goods, polo shirts and even eyewear. Are you getting thirsty yet? Ready to sit down for a spell? If you weren’t lucky enough to snag a reservation for the five-course cocktail-pairing experience at The Aviary — which uses molecular gastronomy to devise unique drinks — this is worth noting for your next Chicago trip. Another trending bar in this part of Chicago (where you can easily walk in), is Prairie School, with an interior inspired by Frank Lloyd Wright’s Prairie School architecture. Walk beyond the leaded-glass wall and you’ll see why: Stained-glass panels hug the bases of bar stools, cocktail tables are crafted from tree stumps and limestone-like walls comprise the bar. Next, walk to Swift & Sons, a high-design steakhouse from Boka Restaurant Group (sibling eateries include Duck Duck Goat and Fish & GT Oyster) where the drinks tilt classic (especially the Oaxacan Old Fashioned) and one of the city’s most revered sommeliers (Marcello Cancelli) builds the wine list. No need to head elsewhere for a nightcap: simply order a glass of wine. Here you can get a glass of, say, Barolo from Bruna Grimaldi or a 3-ounce pour of 1er-cru Burgundy white. Dinner fare skews toward surf and game options, too, such as oysters for a starter with Moroccan-spiced lamb. Before heading back to Milwaukee, visit Duck Duck Goat for dim-sum brunch. Service starts at 11 a.m. on weekends. With Top Chef winner Stephanie Izard at the helm, the restaurant’s dim-sum menu features 19 items, from char siu bao (steamed barbecue pork bun) to Taiwanese pineapple cake, plus soups, cold dishes, sides, fried rice and noodles.